We are human, and being human includes shifts in our energy and changes in mood. Sometimes it is difficult to stay motivated and energized. The first step is always awareness. Take a Power Nap – taking a 20-minute restorative nap in the afternoon gives you a boost of energy to finish your day. Napping can actually help you sleep better at night too. But no longer than 20 minutes, otherwise you are entering REM sleep that can negatively affect your sleep quality at night. Take a Walk – this gets your energy moving, relieves stress and can stop the ruminating. You will come back refreshed with new ideas and solutions. Essential Oils – Try a few drops of essential oils such as ylang ylang, lavender, and chamomile for calm. These can help soothe frayed nerves. I am not talking about lotions that may contain toxic chemicals, but concentrated pure essential oils. Try a drop on the back of the neck or bottoms of the feet, place the bottle under your nose for a good long inhale, or try a diffuser. It takes approximately 22 minutes for every cell in the body to be positively affected. 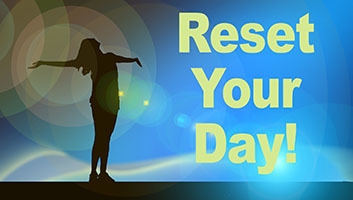 Get a Reiki or Chakra Clearing Session – A Reiki session is a fabulous way to de-stress, relieve anxiety and create balance (a fabulous night’s sleep is a sure thing afterward). A chakra clearing and balancing session clears out the cobwebs – helps you move forward, and helps to clears negative patterns that no longer serve you. You will feel much lighter and have more clarity in your life. 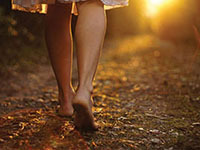 Get Your Feet in the Soil – there are energy pathways in the feet that help our body literally dump the energy of stress and allow fresh new energy in. Get your feet in the water, soil, or the grass. Breathe deeply and let Mother Nature help you let go of your stress and worry. I wish you abundant Summer season filled with much love, passion and adventure. As always I am here to support you in this life journey – and welcome your feedback.